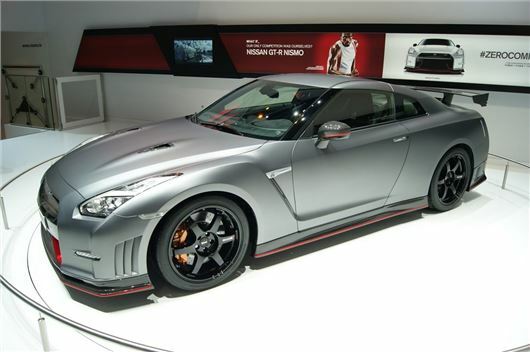 The Nissan GT-R Nismo attracted an appreciative crowd at Geneva - the numbers extracted by the Japanese company's tuning arm are impressive - 600PS, 652Nm and close to £120,000. It's powered by the same 3.6-litre V6 as previous GT-Rs and as before, power is sent to all four wheels through a six-speed automatic with paddle shifters. There’s more than just an increased power output – the GT-R Nismo is also claimed to be more track-focused than the standard car, with increased body rigidity, revised dampers and suspension, optimised steering components and a stiffer anti-roll bar. Additionally the tyres have been specially developed for the GT-R Nismo by Dunlop. The aerodynamics have been changed too, with a new aero package designed to increase downforce and reduce drag. Downforce is equally distributed between the front and rear of the car. Five colour choices are offered – white, black, red, silver and an exclusive to Nismo matte grey. All Nismo models get black, six-spoke alloy wheels. In the cabin the GT-R Nismo features red stitched Alcantara Recaro bucket seats backed with carbon fibre, along with a three-spoke sports steering wheel and various carbon-fibre details. The tachometer is finished in red and the instrument binnacle is finished in Alcantara as standard. Despite all the additions, the GT-R Nismo still managed to look pretty low-key under the spotlight in Geneva. The new car's exact pricing is still unknown and nothing will be confirmed until the car goes on sale in Europe in September 2014.